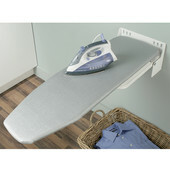 These unique, space-saving Ironfix™ Ironing Boards offer convenience and versatility while adding value to your home. The wall-mount ironing board installs directly to your wall and flips up and out of the way when not in use. 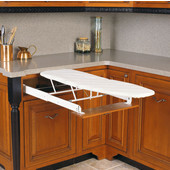 The built-in drawer ironing board mounts to a cabinet drawer and slides away and out of sight when the ironing is done. 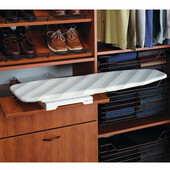 Both ironing boards have epoxy-coated steel hardware and include a heat-resistant, fabric ironing board cover.